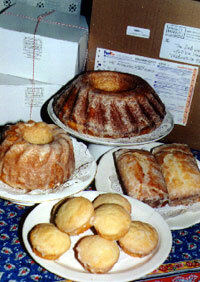 A selection of lemon cakes. To ship three day UPS West of the Mississippi River, all the way to the West Coast $60--Check with us before shipping to get the best rates! "Essell, I just wanted you to know what a hit your lemon cake was! My little 4 year old great nephew thinks you're the best thing since sliced bread! Mom and all the guests loved the cake, and we even shared a piece of it with our server at the restaurant. It was the perfect end to a nice meal with lovely texture and delicate lemon flavor. Thank you so very much for helping to make my Mom's birthday special." "The wonderful lemon cake arrived and I took it to the bridge club to share with everyone where it was the hit of the day. It is so delicious. Thank you from all of us!" "Thank you for the holiday lemon cake. My Christmas dinner guests loved it!" "Thank you so much for making Christmas gift-giving easy! The lemon cakes that I shipped were all a huge success & received with great gratitude." Our lemon cakes are made from a 1930s recipe whose sole ingredients are butter, sugar, flour, fresh whole eggs, fresh buttermilk, pure lemon juice, powdered sugar, non-aluminum	baking powder, baking soda and kosher salt. The cakes interior is fine as velvet, with a delicate shell of a lemon, butter, sugar icing. They taste as pure, fresh, natural and American as a tall glass of iced tea on a porch swing in the middle of summer while sitting with your Grandmother who baked the lemon cakes. Typically we ship on Monday to be able to overnight ship to the tri-state area, and either two or three day ground shipments for most states east of the Mississippi. We accept PayPal, personal checks and money orders.